These provide different sized entrance holes, queen exclusion, drone exclusion, closure, ventilation or any combination of any number of these features. The drawing scale is 4 pixels per mm except for the three large items situated near the bottom of the page. The first of these is that which was designed for the BIBBA Mini nuc. It is hexagonal and is 50 mm between parallel sides. It is made from 16 SWG aluminium sheet and is used either flat or with two opposing corners folded upwards to act as handles for easier manipulation. The pivot hole is 2.5 mm and the three slots are 4.3 mm, 5.2 mm and 10 mm to suit queen exclusion, drone exclusion and full free flight respectively. Closure is achieved by judiciously turning the 'disc' so that the entrance hole in the nuc is occluded by the material between adjacent slots leaving two small breathing gaps that are too small for the passage of a bee. There is a square version as indicated in the diagram at right. I have also seen a circular, aluminium version that had three 'wings' folded up to give rigidity and ease of manipulation. This disc was purchased in the Czech Republic and it is made from white plastic sheet, 1 mm thick. It is 50 mm in diameter and has a 2.5 mm central pivot hole. The queen excluder slot is 4 mm wide by 20 mm length. The full flight hole is 20 mm long, 12 mm wide and has 6 mm radiused ends. The seven ventilation holes are 2.5 mm in diameter. 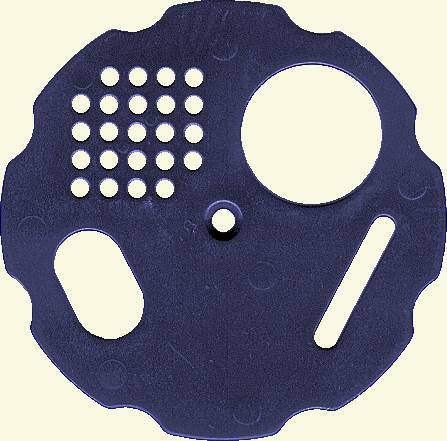 This type of entrance disc is now used by L&RBKA in their 4 x half frame post mounted mating boxes. This disc is similar to the item illustrated above, is also 50 mm in diameter and was designed, by myself, to fulfill the same purpose, but with a little more ventilation. My mating nuc box entrances are based on the same design as the L&RBKA one. This similarity is for commonality and standardisation, not just copying. There are minor differences. Both of the nucleus box entrances, L&RBKA and my own, are illustrated on the Mating Nuc Entrance Standard page. This type is supplied by Stamfordham Ltd. It is thought to originate from Poland. Whilst similar in appearance to the Czech one above it is much larger at 80 mm diameter. It is also substantially thicker at 3 mm. The slots seem identical to the smaller Czech one. Which would indicate the same original manufacturer. I am endebted to Steven Turner, who emailed a scan of this device alongside a plastic rule to enable me to produce the drawing. This similar type is also supplied by Stamfordham Ltd and it's design leads me to believe that the white one depicted above may have originated in Czech Republic rather than Poland. It was manufactured in the Czech Republic and is made by injection moulding rather than machined from sheet material. The central hole is designed to accept a countersunk screw as the pivot. The scalloped edge makes movement with a gloved hand easier. Often a translucent white, or mushroom coloured plastic, produced by injection moulding. Originally designed to fit The Kirchhain type of expanded polystyrene mating nuc. It is similar in design to the larger version (illustrated below left). It is approximately 160 mm in diameter. Some specimens have a graded portion that allows the entrance to be reduced to any size that is considered to be suitable. Either of the two largest types are suitable for the Catenary hive. Usually made in blue plastic, this is very similar to the one above. But it is larger in diameter (192 mm) (one anomaly is that The larger sized one was less than half of the price of the smaller one. Made in blue, red, yellow, white, grey and brown plastic, this version that is sold by the Betterbee company is different in that it has a 'drone excluding' or bumble bee excluding position as well as a portion for queen excluding. Dimensions of this coloured type are 190 mm (7 1/2") dia, with an 8 mm (5/16") pivot hole in the centre. Although it is drawn to a different scale, this disc is almost the same size in reality as the blue version shown above.